Home » About » What is philosophy? 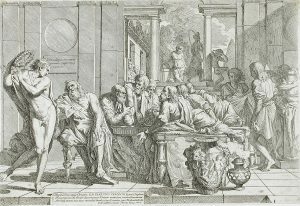 Pietro Testa (1611–1650), “The Symposium of Plato” (1648). The image is familiar: bearded sages; long nights of conversation; the deepest topics. The image suggests an intensive, conversation-driven immersion in issues that, while at some remove from daily practical matters, nevertheless engage with our desire for a meaningful life. There is considerable truth in this idea of philosophy. But a philosopher will say, “this is a story about how philosophy works; I want to know what philosophy is“. One answer: philosophy is the attempt to resolve mysteries—to answer the questions there is (at present) no clear method for answering. Does 111105 ÷ 9 = 12345? We know how to answer the first two questions: we answer the first by looking at Rolf; we answer the second by doing long division. But how do we answer the third question? Pinching ourselves won’t work: someone in a dream could get pinched. Picking up a book and reading it to see if it makes sense won’t work: maybe this is a boring dream where books work normally (or maybe the book doesn’t make sense but we think it does). So how do we answer this question? We don’t know: but philosophers have taken a lot of cracks at it. This is what makes philosophy different from other academic fields. Chemistry, history, biology, and computer science have a stock of established results to draw on, as well as a detailed array of techniques for collecting data and thinking about it. For instance, young chemists spend several years learning lab techniques and bits of chemical theory that are known to yield definitive answers to questions about changes in materials. People working in these fields are often in a position to say “that’s the right/wrong way to go about answering your question”. In philosophy, by contrast, we are rarely in a position to say that. Our field is a bit less about using familiar techniques for answering questions, and rather more about inventing techniques for answering questions. Philosophy therefore requires considerable creativity and freedom of thought, combined with considerable rigour and discipline of thought: the rigour is required because rigorous technique is our goal; the creativity is required because we have no idea at the outset which techniques will resolve our mysteries. Philosophy therefore requires considerable creativity and freedom of thought, combined with considerable rigour and discipline of thought. This, by the way, lets us explain the data we started out with: the idea of philosophy as an intensive, conversation-driven immersion in issues that, while at some remove from daily practical matters, nevertheless engage with our desire for a meaningful life. Issues like this often have answers that we take for granted, but find hard to articulate or justify when pressed. They are therefore mysteries. Philosophy is conversation-driven because dialogue enhances creativity but also serves as a check on wild speculation. And philosophy is intensive and immersive because few things are more fun than rigorous consideration of important mysteries in cooperation with like-minded friends! What other mysteries do philosophers think about? What is it to be a good person? How should I live my life? How should I interact with others? What things are right and wrong? What are right and wrong? When something is right or wrong, why? What is justice? How should a government work? How should a government be elected? What are rights? What rights are there? What is it to own something? What rights do I have when I own something? How should a business operate ethically? Is abortion (or euthanasia, or triage) sometimes not OK, and if not, when? What do we owe to animals, or the environment? What is beauty? What makes something an artwork? What is existence? Why is there something rather than nothing? When are a and b two rather than one? What is it for two things to be similar? Is the world a one or a many? What are the most basic things? How does nature hang together? What is the difference between are and could have been? What happens when some small things make up a big thing? What is knowledge? Is there a world outside my mind? How do I know the world wasn’t created five minutes ago? Is it all just a dream? Is all knowledge based in individual persons or do we have group knowledge? How do we know that two plus two equals four? What is science? What is matter? What is space? What is time? What are numbers? What is an animal? What are the data in support of evolutionary theory? What are genes? What is good about science? To what extent should society support or limit science? What am I? What is a person? What is thinking? What is seeing? What is it to do something? What is consciousness? What is freedom? Are we free? Do we think in words, pictures, or something else? How do we understand language? How does language get its meaning? What is communication? What is truth? When can we be certain we have got it? Why might we want it? What will I learn in philosophy courses? To make a student more creative: people are more creative in dialogue than solo, but dialogue can include a ‘pretend’ dialogue with Socrates. One very important technique is sophisticated reading: being able to pick up nearly anything and read it and (if not too jargony or complicated) understand it. Reading philosophy very carefully is a hard workout that will help a student read anything with more understanding. Another very important technique is understanding how chains of reasoning fit together: how people get from their starting-points to their conclusions, what makes sense and what doesn’t—this is known as logic, and it is a large part of our instruction. Still another very important technique is modeling: how to take something fuzzy or foggy and make it a bit mathematical. If you think of how Isaac Newton used calculus to describe the motion of bodies, that is an example of modeling: in philosophy, we teach students how to get started modeling anything. A final important technique is writing clearly: we are very picky about style and substance; we push our students to write more professionally and convincingly about difficult topics.